Size : 11.4 x 14.2 inches. / 29.0 x 36.0 cm. Description :Franz Ritter was a German mathematician and astronomer whose works are extremely rare. 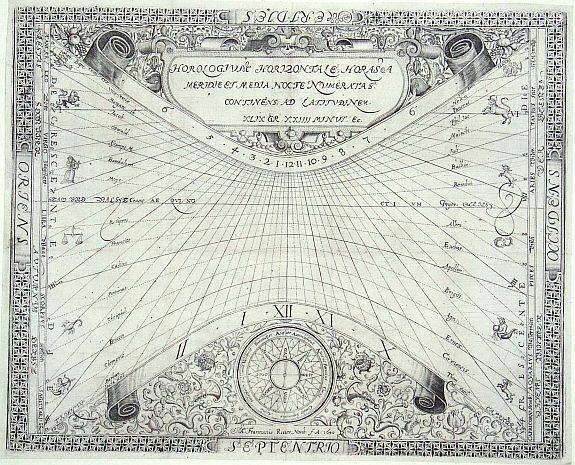 This beautiful engraving is a horological diagram remarkable for the elaborately engraved decorative border. At top is a large cartouche and at bottom is a 32-point wind rose. A very rare and unusual cartographic curiosity. Condition : Good, but map has a new margin at left.